Pillows I made for my baby girl's watermelon pink and gray nursery. I so excited to show you this beautiful watermelon pink and gray nursery for a baby girl who has an equally beautiful name, Ruby. Ruby's mom, Sara, is a full time mama with a full house. Sara and her husband had three little boys before their baby girl, Ruby, arrived. In addition to their own children, this couple's involvement with a ministry that works with at-risk kids in their area brings a number of other children into this loving family circle. I love the textures of the milk glass and chippy metal alongside the pink, chenille changing pad that my friend's sweet mom made from pink bubblegum minky chenille. Do have any advice to share with other moms on how they might use yard sale and thrift store finds in their DIY nursery decorating projects. One item that I see for sale all the time that I used in Ruby's nursery is wooden, wall racks. You can buy these folding, accordion racks at the thrift store or garage sales for $.25. The one that I found was a very unappealing shade of brown so I just changed the color to work with my color scheme with a few quick coats of watermelon pink spray paint that I had left over from painting the nursery chandelier. Ruby's room is amazing! Would you say that it's indicative of your signature decorating style? I call my decorating style "modern farmhouse". You might not agree but when I look at my finished project, that's what I see. 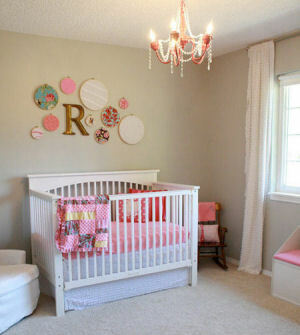 Ruby's nursery is very girly and sweet but it has many vintage, upcycled items that give it a homey, farmhouse feel. Plus, there are a few thrift store finds that I love like the antique, silver dish that I found for only 75 cents. The silver dish, the vintage milk glass vase and the shabby, white metal basket that holds Ruby's diapers make a pretty display on the baby's changing table. These racks are great for hanging baby clothes on a pretty hanger or organizing a baby girl's hair ribbons and you can easily paint them using a can of spray paint in any color that works with your decor. And wooden wall letters like the letter "R" that I used to decorate the wall behind the baby's crib are very inexpensive, as well. If you visit my blog you will see that I have an ongoing love affair with spray paint because it gives such wonderful, instant results. watermelon pink and gray nursery for a baby girl that will help moms that admire your work get started? I added pops of bright pink using the throw pillows that are pictured in the crib and a few pom poms made from tissue paper. I keep a stash of pillows on hand ready to be re-covered so that I never have to need to spend money on pillow forms. I have a large number on hand right now but definitely reduced my inventory recovering pillows for the baby's nursery. I also reupholstered the nursery chair with white duck cloth using instructions that I found online. 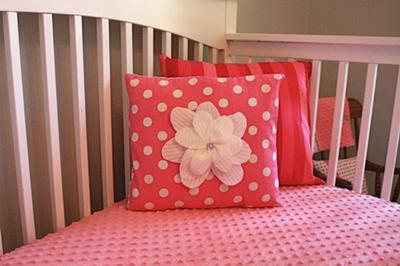 I made the white, fabric flower on the pink, polka dot pillow using a free tutorial. 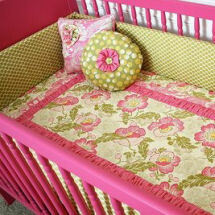 I noticed many areas of your baby girl's nursery where chenille fabric was used, particularly the curtains. Did you make them yourself? I dug through my fabric scraps to make many of the decorations for Ruby's room but the chenille nursery curtains are made from actually a vintage bedspread that I found at an antique store. I knew that the fabric would be perfect for her curtains. To make them, I just cut the spread in half, left the edges un-hemmed and sewed a rod pocket in the top of each panel. 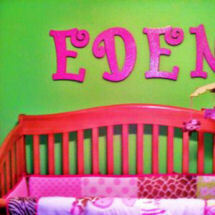 Your baby girl's room has so many adorable decorations that you made yourself; do you have a favorite? 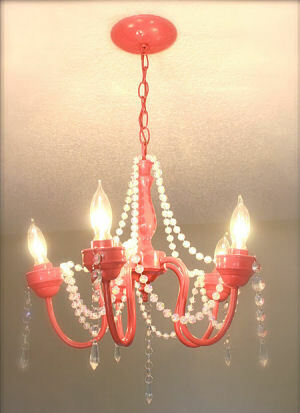 I'm pretty sure the pink chandelier is my favorite thing in the nursery and I bought it for less than $5! I truly believe that Jesus saw to it that this chandelier was there just for me! After painting it with several coats of Krylon Watermelon Gloss spray paint and gussying it up with some faux jewels and a clear bead garland; it is perfect. I've never been a big fan of the color pink until now but every time I pass the nursery I just love to look at it! The pink bubblegum color looks fabulous with the neutral gray wall paint color, Dolphin Fin by Behr. Thanks so much for sharing your nursery pictures with us and taking us for a stroll through Ruby's room. After our tour, I'm sure we all will agree that a watermelon pink and gray nursery for a baby girl is a very, very good choice! To read more about Ruby's room, please visit her blog, It's Good to be Queen. 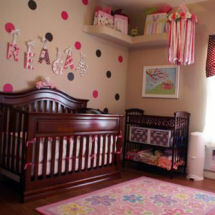 Before you go, we would like to invite visitors to Unique Baby Gear Ideas to please leave a comment to tell this mom how wonderful her baby girl's room is. 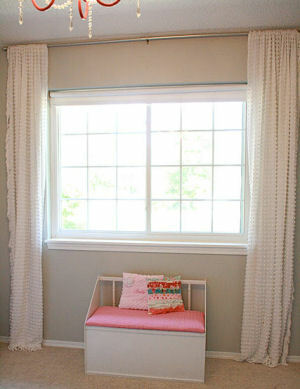 I have been looking for a pattern for rod pocket curtain panels like the ones that you made for your daughter's room. Someone told me that I really don't need a sewing pattern but I'm afraid that I do not have the skills to make them from measurements alone. I also have a brass chandelier I plan to paint and add some bling to. I have spray painted my bathroom vanity light fixture with the Rustoleum hammered look spray paint and was very pleased.